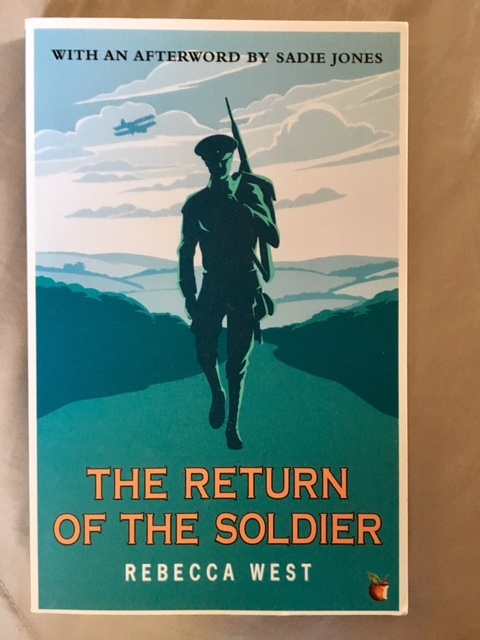 The Return of the Soldier was Rebecca West’s first novel, published in 1918 when she was 24. It’s very different from the Aubrey trilogy, which I’ve written about recently here. The plot of the novel is simple: Chris returns from the trenches suffering from shell-shock. Its main effect is that he has forgotten everything that happened for the past 15 years – which includes getting married to Kitty, and losing their baby son. He does remember his youthful love for a lower-class publican’s daughter, Margaret. It’s to her that he writes when he recovers physical health, and he turns to her for comfort and healing when he’s back in his former home – to the grief and consternation of Kitty and his cousin, Jenny. It’s a short novel – just 140 pages – but carries enormous emotional weight. The tension that builds towards the terrible conclusion is almost unbearable. It’s not as polished in style as the later novels by Rebecca West, and in places it’s overwritten and cumbersome; but it’s still a poised and subtle work of fiction. Just beneath us, in one of Kitty’s prettiest chintz arm-chairs, sat a middle-aged woman. She wore a yellowish raincoat and a black hat with plumes whose sticky straw had but lately been renovated by something out of a little bottle bought at the chemist’s. [How could Jenny possibly know that?!] She had rolled her black thread gloves into a ball on her lap, so that she could turn her grey alpaca skirt well above her muddy boots and adjust its brush braid with a seamed red hand which looked even more horrible when she raised it to touch the glistening flowers of the pink azalea that stood on a table beside her. Kitty shivered and muttered, ‘Let’s get this over,’ and ran down the stairs. This entry was posted in English Literature and tagged Aubrey trilogy, Rebecca West, World War I by Simon Lavery. Bookmark the permalink. Heh, actually blonde from a bottle is pretty recognizable if you know what you’re looking for. Still a very snobbish attitude…. You’ve really intrigued me on this one. But at this point I may not out-live my to-be-read stack! I read this recently and thought it very powerful – and what a remarkable first novel! I was also thinking what a powerful first novel. It’s the one I most associate with Rebecca West and now I know it’s a short one, I think I may (eventually) start with this one when I finally get to her.